I examined tupaiid skeletal specimens at the following institutions: American Museum of Natural History (AMNH), New York; Field Museum of Natural History (FMNH), Chicago; United States National Museum of Natural History (USNM), Washington, DC; Museum of Comparative Zoology (MCZ) at Harvard University, Cambridge; Natural History Museum (NHM), London; Muséum national d'Histoire naturelle (MNHN), Paris; Nationaal Natuurhistorisch Museum (NNM), Leiden; Muséum d'Histoire Naturelle (MHN), Geneva; Forschungsinstitut Senckenberg (FS), Frankfurt; Zoologische Staatssammlung (ZS), Munich; and the Swedish Museum of Natural History (SMNH), Stockholm. In addition, I studied plesiadapiform postcranial specimens at the AMNH, the MNHN, and the Carnegie Museum of Natural History (CMNH) in Pittsburgh and examined postcranial specimens of other archontans at the AMNH, MCZ, and in the research collection of F. S. Szalay (FSS). All of the specimens examined in this study are listed in Sargis (2000, Table 2.2). In this chapter, I tested Beard's (1993b) hypotheses using his own methods in order to determine the effects of changing some of the variables (i.e., taxa and characters) and therefore, followed Beard (1993b) in conducting a phylogenetic analysis using PAUP (Swofford, 1993, Version 3.1.1). Like Beard (1993b), I performed an exhaustive search. No characters were ordered or weighted, and trees were rooted using a hypothetical outgroup (all characters coded as zeros). Three separate analyses were conducted using Beard's (1993b) methods, each with some change to the variables included in the analysis. Analysis 1: In this analysis, two variables are different from those in Beard (1993b). A) While Beard's 29-character data set was used, several characters were recoded because some of Beard's character codings included erroneous observations (e.g., see Hamrick et al., 1999; Simmons, 1994; Stafford and Thorington, 1998). The relevant references for character states that were subsequently corrected are included with all of the characters and character states in Appendix A. B) While I included the same taxa as Beard, I used a different genus to represent the order Scandentia. Beard used Tupaia to represent Scandentia in his analysis, but Ptilocercus was used to represent Scandentia in this analysis because it has been proposed to be the most primitive living tupaiid (see earlier section). The purpose of this analysis was to determine if the use of Ptilocercus to represent Scandentia had any effect on the results. Characters #1-22 in Appendix A represent Beard's (1993b) postcranial characters (#8-29). Beard's (1993b) craniodental characters (#1-7) do not vary between Tupaia and Ptilocercus. 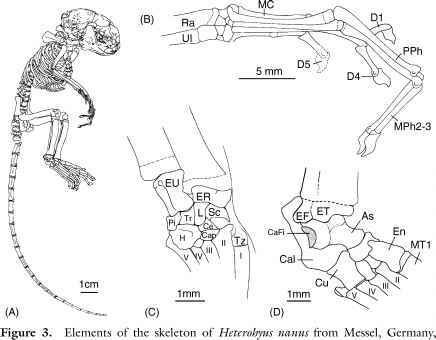 Analysis 2: In this analysis, only postcranial data were used, but additional postcranial characters, some of which have been used to support the Volitantia hypothesis (e.g., see Simmons, 1995), were added to the data set. The combined postcranial data set included Beard's (1993b) 22 postcranial characters and 20 other postcranial characters from additional sources (see Appendix A). Appendix B represents the character-taxon matrix for this analysis. In addition to the exhaustive search (following Beard, 1993b), a bootstrap analysis with 1000 replicates was also performed. The purpose of this analysis was to determine if adding additional postcranial characters to the data set changes the results. Analysis 3: In this analysis, Chiroptera was excluded because molecular analyses have consistently supported the exclusion of bats from Archonta (e.g., see Murphy et al., 2001a,b). The purpose of this analysis was to determine if Primatomorpha is supported when it is impossible for Volitantia to be supported. In other words, if the possibility of a Dermoptera-Chiroptera clade (Volitantia) is eliminated, then is a Dermoptera-Primates clade (Primatomorpha) supported? Functional analyses of tupaiid postcranial characters, as well as an a priori analysis of Beard's (1993b) characters, have been reported elsewhere (Sargis, 2001, 2002a,b,c,d). In this chapter, I report the results of an a posteriori character analysis conducted in MacClade (Maddison and Maddison, 2001, Version 4.03) in which I mapped the characters in Appendix A onto the tree produced in recent molecular analyses (Figure 1D).